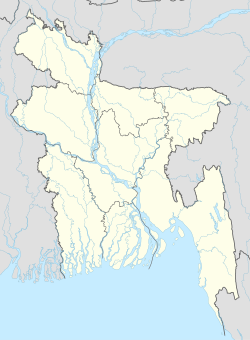 Madarsha Union (Bengali: মাদার্শা ইউনিয়ন) is a Union of Satkania Upazila in the Division of Chittagong, Bangladesh. Madarsha Union is in the eastern portion of Satkania Upazila approximately ten kilometers distance from the headquarters of upazila. According to 2011, Madarsha union total people is 38,266. Madarsha union are population density is 1600 per square km. or 4200 per square mile. ↑ "Satkania (Subdistrict (Upazila), Bangladesh) - Population Statistics, Charts, Map and Location". citypopulation.de. Retrieved 2018-04-22. ↑ "মাদার্শা ইউনিয়নের ইতিহাস - মাদার্শা ইউনিয়ন - মাদার্শা ইউনিয়ন" (in Bengali). madarsaup.chittagong.gov.bd. ↑ 3.0 3.1 "এক নজরে মাদার্শা ইউনিয়ন - মাদার্শা ইউনিয়ন - মাদার্শা ইউনিয়ন" (in Bengali). madarsaup.chittagong.gov.bd. ↑ 4.0 4.1 "সাতকানিয়া উপজেলা - বাংলাপিডিয়া" (in Bengali). bn.banglapedia.org. This page was last changed on 21 January 2019, at 02:25.